Chances are you may not know much about Peter Lockett. Sure, you've perhaps seen an article or two he's written on Indian percussion for Modern Drummer, but what's the buzz? Is he a player? Well, for starters, he's got a bio that lists record dates as diverse as Björk and Kula Shaker, and film dates like The Bone Collector and the 007 thriller Tomorrow Never Dies. Don't get out to the movies? How about this, then: Lockett works hand-in-glove with famed drummers like Gary Husband and Bill Bruford. Recently, Bruford told MD, "Pete is highly thought of in this neck of the woods. He has a full understanding of the Indian system but is able to explain it to us idiots on the drumset. I consider myself a student of his in many ways." Incidentally, the "neck of the woods" to which Bruford refers is London, England, where thirty-four-year-old Lockett makes his living recording, touring, and - when he gets a spare moment - teaching. A further sign of his arrival: Lockett joins the impressive roster for London's annual Rhythm Sticks Festival this July. For the event, he will lug about twenty flight cases into the venerated Royal Festival Hall. Then he will spend hours ensuring that all the acoustic instruments and electronic percussion are tuned, tweaked, and synced with hard-disk computer systems. The occasion is a duet Lockett will be performing with film composer David Arnold called "Dark Theatre." As Lockett puts is, "It's kind of improvising a soundtrack live, including live sampling and manipulation." This is a peak in Lockett's career, which began with the English boy's curiosity about sounds outside of the conventional drumset. 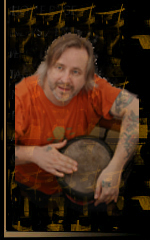 Peter has a working vocabulary - and is often fluent in - drums and percussion from India, Japan, China, North Africa, the Middle East, Ireland, Cuba, Brazil, and Bulgaria. Because of his familiarity with the drumset, he works well with drummers like Bruford, with whom he performs in the group Network Of Sparks. A graduate of the University of Madras - ironically located in England - Lockett would come to immerse himself in Indian music. His intensive study of its key components began, he recalls, when he happened upon a free concert with Ustad Zakir Hussain. Up until then, Peter was primarily a kit player, and he was stunned by what he saw: "Usually if you watch a drummer, you can see the speed his hands are moving at - you can see the notes being articulated, and you've got an idea of what's happening. But with tabla, I had no concept of how he was making all those sounds." MD asked Peter about the learning curve required to educate himself in Indian and other indigenous percussion. PL: It took quite a while, actually, I think the way around it, pyschologically, was that I was using it as an additional source of material for the drumkit. Slowly, it overtook that and became a study in its own right: I would say it took about nine months before I began to focus on the tabla. In the beginning, because it was a mystery, it was more a rhythmic study: It's difficult to put those rhythms on the drumset. PL: I don't know. It's mysterious: it's the way it's articulated for a start. Tabla is right-hand heavy; obviously you can develop a lot of technique with the left hand and "bass" drum. But it's unbalanced, which was unusual for me. As a kit player, I had always tried to be as symmetrical as possible. The other thing is that the notes are much more resonant, and to try to find those resonances on an essentially staccato-sounding instrument like drumset is quite a challenge. BW: When you say "drumset," what styles were you playing at the time? PL: It was a mixture of jazz/fusion and rock - but not heavy rock, Bebop was a big thing. BW: How long did it take you to get a sound from the tablas? PL: Oh man! It's amazing, I've always told people when they come to me for lessons: "Don't panic. It's going to take a while to get a sound." And, I suppose, to really start articulating sounds properly took a year to eighteen months. You can make a sound, but you think, "God, that doesn't sound like anything!" BW: And, of course, it's probably dependent on learning rhythms that are essentially foreign. PL: Absolutely. It is blind learning in many ways. When I taught in an Indian school in London, the little four-year-old kids would come in, and their hands would go onto the drum not exactly in the right position, but in a sort of mutant version. The left hand would be doing a glissando thing on the bass drum; it wouldn't be quite the right sound but they knew. They'd seen it in their homes and knew a lot about the instrument before they started taking lessons. Being brought up in a Western tradition, there's a lot of extra learning going on - "learning in the dark." There's a lot of information to fill in. BW: Take an absolute novice. What would be among the first things you would teach him or her? PL: Something called a khaida - a theme and simple variation. Different people start in different ways, but I start with a basic khaida and the open, resonant ghe ghe stroke with the left hand, and the closed te te stroke on the right hand. It's almost like a version of the double-stroke roll: ghe ghe te te. Again, the ghe is the open, resonant bass stroke with the left hand, and the te stroke is a closed, non-resonant sound on the black spot of the small drum with the right hand. For someone from the West, it's a good starting point. BW: To what extent is Indian music improvised? PL: That's an interesting question. I have always maintained that it's not as improvised as it's made out to be. There are so many rules and regulations that, as much as it is improvised, it's also a demonstration of knowledge and rules. BW: With your experience, you must spot the poseurs right away. How do they reveal themselves? PL: It's quite amusing, actually. It's immediately obvious. Part of it is tone control. If a player is not studied, yet plays the basic time cycles, then that's a good tabla player - someone who is doing the job. In any business, the poseurs are the ones who camp it up and go for things they can't quite reach. BW: Is there an Indian equivalent of the Cuban "crossing the clave"? PL: At any one point, the sitar player will be keeping the repetitive, say, sixteen-beat melody, whilst the tabla player does a solo. Similarly, the tabla player is keeping the repetitive rhythm under the sitar player's improvisations. If they come out in the wrong place, with a rhythmic cadence called a tihai - basically a rhythmic phrase played three times, calculated to end on beat 1 - everyone can see that. The first note of the tune is more often the tonic, or the keynote of the piece of music, so it is obvious. In Indian concerts, the audience is clued in: Quite often they are sitting there clapping the time cycle. When I was learning, I could listen to a piece of music and not have a clue where the time cycle was. Now I always know where it is, and I can't switch off from it. I can hear the actual "words" of the instruments. BW: The tabla has that black dot to center the tone and pitch. That seems to be characteristic of indigenous instruments of other countries. PL: One of the similarities that surprised me is that of the bata and the mridangam, to such an extent that on the larger bata there's a doughy substance to make it bass-y. Similarly on the mridangam, they put semolina dough on the bass end, and on the treble end there's the arajhapu. It's a stroke you play with the side of your hand by the little finger - a muted overtone type of stroke, and you find that on the mridangam and the bata. I've not researched it, but there must be some sort of link. BW: I know you have a familiarity with taiko drums - that's another huge study. PL: I work in a duet with a drummer from North Japan, Joji Hirota. We take about forty drums out with us - a couple of hundred kilos, which can be hairy when you're flying. It's expensive: I play tabla, kanjira, bongos, frame drums, and a little "floor" drumkit - a little like Trilok Gurtu's - built by Premier. Joji plays congas, bongos, taiko drums, and Japanese prayer bells, and also sings. Our CD Taiko to Tabla has just come out. BW: You mentioned taiko drums and bongos in the same breath. That says volumes about the kinship of percussion. PL: Yes, and it's a concept people are interested in. It's not just drummers and percussionists: it's all walks of life. BW: When you do a recording session, say with Björk, do you track live or overdub? PL: Generally it's a mixture. You go to a session and they're not always sure about what they want. They might ask for tabla but they'd rather you play bongos. Rarely do I get a call specifically for an ethnic instrument. Quite often, they want something that isn't locatable ethnically - something that is "anonymous." BW: What did you do on the James Bond and City Of Angels films? PL: A mixture of things: some tabla, but mainly Japanese/Vietnamese drumming. There are similarities. For Angels I did general percussion - tablas, congos, bongos, and things like that. BW: Do you think people are calling you, instead of, say, Ray Cooper, because of your reputation for getting to the heart of some of the traditions? PL: Yeah... but I think what gets you sessions is your willingness to be open-minded and creative - and, in some ways, untraditional with those instruments. I worked with one famous Indian film composer, and we went through lots of different percussion instruments. We tried a bit of tabla, and he came out and said, "No, no, it sounds far too Indian!" So I ended up playing on this session with an Indian film composer, playing tablas like bongos! I remember buying an album eight years ago by Keith Jarrett called Spirits, where Keith was playing all these instruments including tablas. I was disappointed and gave the record away. Two and a half years later somebody bought me the same record for Christmas and I listened to it with a different mindset. I realized that you could make music on an instrument without knowing anything traditionally about that instrument, as long as you have a musical mind. Jarrett knows nothing about playing tabla technically, but on the instrument he can find good sounds, follow the contours of the music, and create something nice. BW: Great for you to discover that now, after spending so many years learning the traditions! PL: It is important to learn it, like a language, but you don't always turn around and wonder, "Was I using that word correctly?" You just communicate. The grammar is almost irrelevant, as long as you're getting the message across. BW: There's technique and there's vocabulary. Take maracas: They're incredibly hard. PL: To play them accurately, yeah. It's funny the number of sessions I've been at where a singer has recorded the shakers or the tambourine down first, and you can't play along to it! You have to suggest, "Look, it would be better if we also replaced the shaker and tambourine." And when you do that, it's amazing how surprised people are. They say, "That's unbelievable; I can't believe how bad the other track sounded!" BW: How did you meet Bill Bruford and get the project Network Of Sparks underway? PL: We're both in England, and he'd been reading my magazine articles. We met at some sort of percussion event, and he came along to a recording session I was doing. We had lunch and thought, "Why don't we do some recording as well." The opportunity came up for us to play at the Rhythm Sticks Festival, and it's taking off. I think he's interested in percussionists, generally. He's a fan of Glen Velez and hand drummers. It's a mystery area for him. He's into tonal playing and unusual sounds, judging from some of the sounds he gets from his electronic kit. BW: How did you decide on the division of labor? PL: We had to find things that worked. It was a matter of sitting down and playing. We have some road maps. When you put five percussionists together, as we have in this group, it becomes difficult to find something that really works. BW: You bring material into the group. What is your process for composing? PL: One of the ways is to start with a vocal/percussion idea. Alternatively, it might be coming from an idea for mallets. I've got the computer and can come up with an idea and chart it out. Some of my ideas are written with an intent that doesn't actually transpire when you get together with players. Plus we like to have a lot of improvisation. BW: Have you come across any ethnic styles that don't mix well? PL: I think it's people that don't mix, rather than traditions. Attitude and an open mind are important. What doesn't work is simply putting together, say, an Indian percussionist, some jazz musicians, and a Japanese drummer. It has to be carefully thought out. I believe that the real collaborations only work when the people have studied each other's musical forms. Otherwise it's a matter of me doing my "Western thing" and you doing your "Indian thing". That doesn't work. BW: What's an average day like for you in London? PL: I look at myself as an oddity. I do lots of weird and different things. My experience of the session world is not typical. My life existence is a balance of live work and sessions. I feel lucky to be touring with a percussion duo, playing just percussion music. I love playing with other people - the standard gigs. But to have two percussion-focused situations on the go - the duet and Network Of Sparks with Bill Bruford - is great.